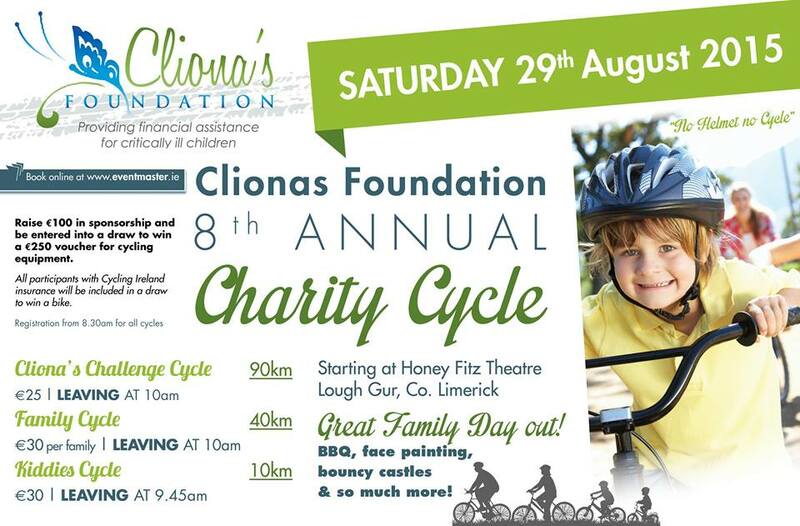 This will be the 8th annual cycle for Cliona’s Foundation and will take place on Saturday August 29th from the Honeyfitz Theatre in Lough Gur. With three routes including an 10km for kids and funsters, we have appealed to experienced cyclists with a challenging 90km route and a 40km less arduous family route for leisure cyclists. Following the cycle there will be a BBQ, face painting, music and a bouncy castle to keep the entire family entertained. So popular is cycling that Cliona’s Foundation has founded it’s own cycling club which is affiliated to Cycling Ireland and is gaining new members each week. Stay tuned to Cliona’s Foundation on our site, Facebook and Twitter for further updates.